Hackensack "Slam Dunks the Junk!" You may notice a scarcity of litter this week. 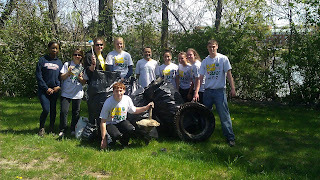 That is because this past weekend the City of Hackensack participated in the "Slam Dunk the Junk" campaign. 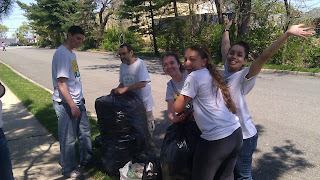 The event coordinator Charlotte Panny made the event possible through a New Jersey Clean Communities grant from the NJDEP. Panny said the day is "all about making a difference," and it was great to see the widespread community support and involvement. More than 150 volunteers from a dozen local community organizations converged on the City's parks and streets with rakes, shovels, and garbage bags to give the City a little face lift. A special shout out goes to Java's Brewin' of 270 Main Street for hosting the volunteers for morning coffee and registration. A shout out to Rita's of 184 Essex Street (Lodi) for donating cool treats for the volunteers! Another special thanks and shout out to the members of the Hackensack Elk's who hosted the volunteers for a barbecue lunch. As part of their continued community outreach, this past weekend the Hackensack Elks hosted a dance for teens with special needs. There were almost twenty teens present, they had a wonderful afternoon filled with music, entertainment, and dancing. The Elks is a national service organization with a 140+ year history and nearly one million members in 2,000 lodges around the country. Local lodges invests in their communities through programs that help children grow up healthy and drug-free, by undertaking projects that address unmet needs, and by honoring the service and sacrifice of our veterans. The Order of Elks spends more than $80,000,000 per year in charitable programs. 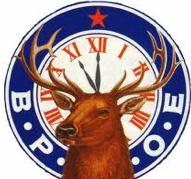 If you are interested in becoming an Elks you can contact the Hackensack Lodge at 201-487-0658. On Thursday, April 25, 2013 the Hackensack Rotary Club held their weekly luncheon with special guest, Hackensack City Manager Stephen Lo Iacono. Mr. Lo Iacono made a presentation to the club detailing the city's initiative on the Main Street Re-development Program. He also touched on the positive effects of the upcoming Super Bowl and the potential benefits to Hackensack businesses. He also informed the club of Hackensack University Medical Center's new affiliation with Georgetown University's Medical School. There are 33,000 Rotary clubs in more than 200 countries and geographical areas. Clubs are nonpolitical, nonreligious, and open to all cultures, races, and creeds. The Foundatio is a not-for-profit corporation supported solely by voluntary contributions from Rotarians and friends of the Foundation who share its vision of a better world. The Malin Family, whose son is a four-time survivor of Leukemia, has been influential in the organizing of an event to raise funds for Leukemia research. 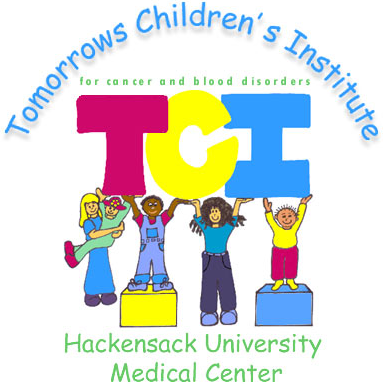 The City of Hackensack, Hackensack High School Student Council, and Latin American Cultural and Art Institute will be hosting "A Walk for Tomorrow" on May 11th to raise funds for Leukemia research. There is a $10 registration fee and participants are encouraged to raise $300. The funds raised will not benefit the Malin Family directly, they will be used to fund Leukemia research and renovate the hospital rooms at the Hackensack University Medical Center's Joseph M. Sanzari Children's Hospital. 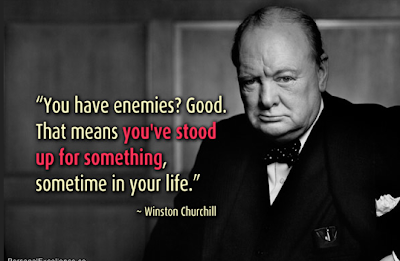 For more on Edward's story, click here. For more on the walk you can click here. You can access the registration forms and participate in the event by clicking here. City Council declares April "Autism Awareness Month"
This evening the City Council declared April "Autism Awareness Month" in the City of Hackensack. Sara Malvasia, a Hackensack Police Officer, was present to accept the proclamation and extend her gratitude to the City. 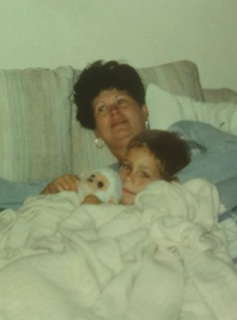 Malvasia noted her appreciation; her seven-year old child is autistic, and she is an advocate for raising awareness. Mayor Melfi noted that he hopes this can be done again next year and he knows of programs such as "Light It Up Blue." On April 2nd, a number of prominent buildings, universities and landmarks utilize blue lights in commemoration of World Autism Awareness Day and to "kick-off" Autism Awareness month. Autism is a neural development disorder which has an effect on social interaction and communication. The Center for Disease Control and Prevention reported that 20 in 1,000 children in the United States were diagnosed in 2012 (up from 11 in 2008). This evening the City Council approved the addition of Class II officers to the City Police Department. The PD will now have the ability to hire full-fledged, certified, police officers for an hourly rate in the event of shortages or special assignments. The officers will be paid between $15 and $20 per hour, will not be afforded benefits, and will be assigned a firearm only when on duty. There seems to be great benefit to this program as the use of Class II officers on walking posts, the Municipal Court, Housing Department, and parks will allow the existing full-time officers more time to effectively police. This effort will expand on this drive to improve quality of life concerns, there is no question that under Director Mordaga, certain troubled areas in our City have shown definite areas of improvement. My only concerns however are the hiring processes and the possible union conflicts that may arise. The hiring practices will be outside our normal civil service guidelines, therefore there arises the possibility of a lesser caliber, non-resident, being "worked into the system" (but then again, residence guidelines were never really followed too strictly in this City--it has already been established a number of officers including two of our three Captains never complied with residency requirements). In terms of possible union conflict, I do foresee possible backlash from the potential loss of overtime. The City will have a hard time justifying the authorization of over time duties when there is a near almost endless (25% of the department) supply of "cheap labor." Likewise I am sure the school athletic programs will want to utilize the cheaper labor as multiple officers are common at football and basketball games and police presence for other sporting events and school functions is routine. Lord knows the last thing we need is any further litigation or loss of morale in our police department. The City Council approved the refund of $349,827.36 (for 2007-2010 tax years) to Regent Care of 50 Polifly Road. On a building that is paying approximately $541,625 per year, we sure missed the mark on that assessment, but that seems to be a common occurrence in Hackensack, as Mucipal Accountant Steven Wielkoltz said of the 2013 budget, "Twenty-four percent [of the tax increase] is directly related to the loss in ratables from tax appeals." Council Candidate Victor Sasson applauded the City for having a recycling station in their Green Street facility. He however pointed out that though the residents have not widely adopted use of the facility, we are manning the facility six days a week. 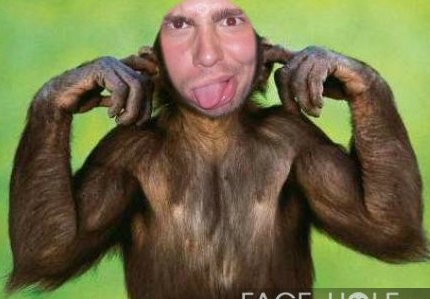 Sasson remarked that whenever he has visited the facility he has observed a city employee inside reading the newspaper. He suggested that due to the limited use the facility, it be opened either at conveniently scheduled times or by appointment. DiPasqua also wanted to know why legal fees were reimbursed to an exonerated officer this evening before the City has received a coverage determination from their carrier. Now let me ask you the resident and taxpayer, if you had an accident with your car would you have the damage fixed before the adjuster came to look? City Attorney Joe Zisa seems to have a problem finding a parking space, despite more than a dozen being available at the time I arrived. Tonight the Board of Education held their annual reorganization. New Board of Education members Rodriguez and Hoffman were sworn in, as was returning Albolino. Ronnie Bolcik-McKenna was named President and Angel Carrion was named Vice President. After the pleasantries and formalities of the reorganization the regular meeting of the Board of Education commenced with a special presentation from the cast of Rent (a recent production at HHS). What a presentation it was, we do have among the best Drama and Performing Arts students. A common thread through the meeting was a seven vote yes streak to a two-trustee series of questions. Rather than being able to ask questions and understand the items relating to a $97 million budget and the future of some 5,500 students that they were voting on, they were met with sighs and groans from the audience and a hurry up attitude from the Board President. It appears that the voters are one step closer to getting what they want--consensus without independent thought or reasoning. Trustee Larkins remarked that he was told last year by President McKenna that he could not be the Chairman of a Committee because he was a first-year board member. When he asked this evening why newly elected first-year board members were made Chairmen he was told that it was "the President's prerogative." Who is playing politics and not being transparent? Trustee Martinez questioned the wording of a number of agenda items and questioned the selection process for the insurance carrier, and pointed out the involvement of Former Mayor Jack Zisa as the Risk Manager. Gee, that Zisa name pops up everywhere, those guys have their fingers in everything. Salkin (Board Attorney) was quick to reply that when hiring, it does not matter whose name may be associated or what their independent profession may be. Trustee Martinez also questioned the selection and hiring process for hiring the attorneys, and other professional firms. She noted that interviews were not conducted or resumes reviewed. Salkin quipped that all of these firms were previously hired and "you are just extending a continuation of their contracts." Well, just because it is what was always done, it doesn't mean that it should not be reviewed, and changed from time to time. On the hiring of those four law firms Richard Salkin was hired at an hourly rate of $150, for an amount to not exceed $95,000. I addressed the board and asked how that amount compared to previous years as Mr. Salkin's 1099's for the last two years exceeded the $95,000. I remarked that I understand the 1099's are issued on a calendar year, not a fiscal year, but for Salkin to have had a high 2011, he would have to have a lower 2012 to stay under the fiscal year cap. Salkin remarked that he 'went over' in only one of his years as Board Attorney, but then when I asked why I could not find the caps for the last three years (when reviewing minutes) and none of the board knew the cap he quipped that this was a new procedure that was brought by Mr. Kramer the School Administrator. I am lost, so did he go over once in his years or was there never a cap until now? I don't know about you but when reviewing a $97 million budget and setting policies that will have an effect on the future of our some 5,500 students, I would like to see Board Trustees submitting questions and showing a genuine interest and desire to understand every agenda item on which they vote--not just smiling, voting, and remarking how good the sports and extra curricular activities are. Remember, in the words of John Major "A consensus politician is someone who does something that he doesn't believe is right because it keeps people quiet when he does it." 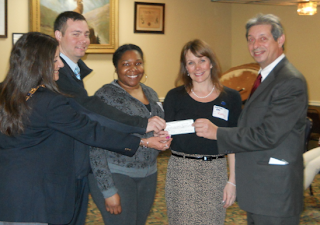 Through the Elks National Foundation, this evening the Hackensack Elks presented a $600 grant to the Youth Consultation Services to help with their efforts to restore their Washington School, which was flooded in Hurricane Sandy. The Elks have hosted the children of YCS for events in the past and look forward to continuing to partner with this fantastic, local, youth foundation in the future. In response to the April 7th scoop "Is the Coalition for Open Government backed by the "Zisa/Hurwitz Political Machine?" an incident report was left with the Hackensack Police reporting harassment (click here to view). Richard E. Salkin, former City Attorney, current Municipal Prosecutor, and current counsel to the Board of Education, reported to HPD headquarters at 9:07 pm (April 7, 2013) to report that a picture of his home was published on the Hackensack Scoop. Salkin reported that as Municipal Prosecutor he fears for the safety of himself, and his family, because his address and license plates were visible in the photograph. The original photograph, as published on the Hackensack Scoop, does not display Salkin's home address, nor are the license plates of any automobiles in the driveway (therefore reasonably believed to be Salkin's) immediately visible. HPD has advised that they confirmed with the Bergen County Prosecutor's Office that there was no illegality in the pictures posted by the Hackensack Scoop. 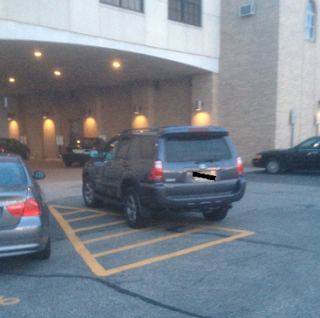 However, in a gesture of good faith, the license plates of any vehicles photographed were redacted by the Hackensack Scoop. Hackensack Scoop questions the sincerity of Salkin's report as upon further investigation, it appears that Salkin is listed. An internet search for "Salkin, Hackensack" did return his home address. These search results are pictured below, redacting personal information, out of respect for Salkin's privacy. The Hackensack Scoop is left only to wonder if this report was instead intended to harass, intimidate, or otherwise stymie Gelber in the same manner as [Gelber believes] a defamation suit filed [by Salkin against Gelber] in July 2012 stemming from a May 2012 letter to the City Council was. It appears that the Hackensack political machine has maintained control of the BOE with Albolino, Rodriguez, and Hoffman winning by [with three districts left to report to the Hackensack Scoop] a 2 to 1 margin. Congratulations to the voters who will get what they vote for--more of the same. I can't wait to see the campaign filings and follow the money trail back to the same old special interests. This evening a town hall forum was held at the Nellie K. Parker School to discuss the proposed leasing of the Padre Pio Academy, located at 100 S. Main Street, which is slated to close this school year. There is a freight train coming in the Hackensack Public Schools, and we should have heard, or seen, it coming--long before now. With overcrowded kindergarten classes, a present problem in the district, the forecasted five year growth of our fifth, sixth, seventh, and eighth grade classes will far exceed the size of the 5ive 6ix School and Middle School buildings. Mr. Abate was quick to pass the blame, [rightfully so] as he is a relatively recent temporary hire with a maximum two-year contract by state mandate, and went on to identify the high turnover of our administration as a major contributing factor to this dilemma. Abate noted that at the time of his hiring the long term plan for our district, a typically five-year forecasting document, was seven years old. 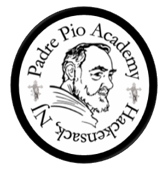 Abate plans to lease the Padre Pio Academy for a five-year term and move the majority of the district's pre-kindergarten and kindergarten students to the building. In the longer term, he would like to move fifth grade students back into the district's four elementary schools while moving most of the district's kindergarten and pre-kindergarten students to the Padre Pio Academy building. Abate discussed the possible alternatives to this solution: redistricting, the use of trailers as classrooms, and even split-scheduling. He knocked down each of these options noting the lack of a long term solution and the burden that an idea such as split-scheduling would put on parents (to find care, among other things, for their children). The night was filled with heated emotions as parents addressed the Interim Superintendent and voiced their concerns for the education of their children. Parents cited that transportation will not be provided, that families with multiple children will need to pick up and drop off children in multiple locations at the same time, and even concerns that the movement of fifth grade teachers [who specialize in specific subject matters] may have a detriment to the education of their children. After an hour of open question and answer, the financial burden that this plan will put on our district was not even broached on. No parent had asked about, and Abate never cited, the spending of one additional dollar in the Board of Education budget. I addressed Abate, and the audience, citing that this is a plan that will have great emotional and practical considerations for all concerned. Though I am not a parent, the plan has different emotional considerations for me. I am a product of the Hackensack Public Schools, as were my parents before me. This plan will forever change the district that I know, and love, and will have impact on my future children's education and my decision to lay roots in this great city. Though this is a plan that is caught in a mix of emotions by all parties, there are very important financial considerations that must be addressed. I wanted to know the cost of this project that Board Trustee Angel Carrion is quoted as saying could be upwards of $1,000,000 per year! I asked about the need for increased staff. Mr. Abate projects there to be no need for additional teachers, administrators, or custodial staff. He indicates that the teachers will be moved from their present buildings to this building while the merger of the 5ive 6ix and Middle Schools will make available additional administrators to move to the Padre Pio Academy. When asked about custodial staff, Abate was quick to note that the staff will be included in the lease (a consideration that I would imagine will have labor relation concerns with the district's union custodial workers). The current negotiation stands at a five year term (at a cost Abate would not disclose or even approximate). I noted my concerns about the viability of this plan as Abate projects 623 pre-kindergarten and kindergarten students in 2017-2018 while the Padre Pio Academy can only house 300 (as cited by a gentleman who spoke) students. I noted to Abate that this plan will either be a great success or a dismal failure. If it is a dismal failure, why are we seeking a five-year lease term and not a one-year term with renewal options? If this does not work, why are we the taxpaying public going to be stuck on the hook for five years? If it is a great success and we need to acquire this building, the Archdiocese of Newark (building owner) would see our need and be able to name their price, why is there not an option to buy the building at a pre negotiated price included in the lease? Abate was quick to note that we were negotiating in good faith with "men-of-the-cloth" and a level of trust must be conferred. I hate to be a cynic but there is a reason that the Catholic Church is the wealthiest of organizations in the world. Abate was steadfast in his refusal to approximate the cost to the taxpayer (indicating that he would lose leverage in negotiations) but indicated that it was in fact appropriated for within the proposed budget for the 2013-2014 school year. When I asked how I, as a voter, should be expected to vote TOMORROW on a $97 million budget, he answered that I must put my confidence in him. 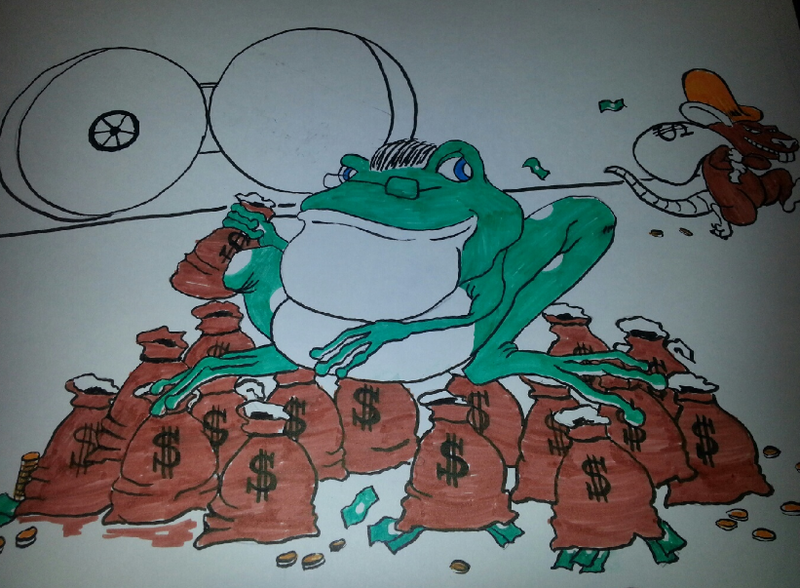 The administration has played, what I identified to Abate as, tomfoolery with the budget. He has taken his projected costs to run the Padre Pio Academy and played, what I went on to identify as, a shell game. I am left only to assume that he has allocated his projected operating costs for the Padre Pio Academy to other line items in the budget and will later reallocate that money (an assertion that Abate did not correct, leaving me to believe it is an accurate portrayal of his proposed budget). Abate again reiterated that I must trust that he is confident with the budget and that the right appropriations have been made. This to me is ludicrous, as Abate has presented a proposed tax levy to voters based on a budget that is filled with possibly "misrepresented line items" to arrive at a necessary gross figure. What I see here is a very expensive Band-Aid to be placed on a potentially mortal wound. Given the size of the Padre Pio Academy, a size that is too small for our long term needs, I feel that we may be playing short term defense rather than long term offense. Mr. Abate cited the interests that a charter school had in the building, and charter schools put a great strain on the resources of our district (to the tune of an Abate estimated $15,000 per pupil). Are we creating a long term viable solution or are we making a short term fix while stopping a major pain from moving to town? Though I am sure Abate is a fabulous, and well qualified, administrator he is asking for a lot of faith from a voting public when he, who is scheduled to make his departure in November, will not be here to realize the potential repercussions of this massive undertaking. Donald Burke, Esq. appeared in front of the Honorable Peter Doyne in Hackensack on Friday, April 12, 2013. Mr. Burke was representing plaintiff Steven Gelber, of the Hackensack Scoop, in an effort to recover legal fees from the City of Hackensack in the amount of $13,975. 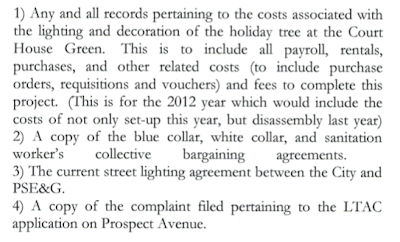 These legal fees were accrued as a result of the city's denial of an OPRA request for a copy of the DPW (Blue Collar) and Sanitation Worker's collective bargaining agreements. 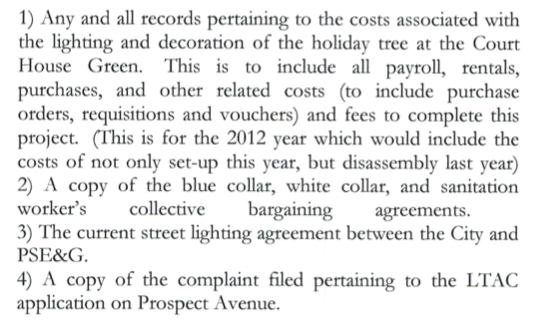 The matter began on December 5, 2012 when after questioning why the city's holiday decorations were assembled, a seemingly routine task, on holidays where the worker's were paid overtime, Gelber submitted an OPRA request seeking further information. See Gelber's OPRA request below. Ms. Heck, the City Clerk and custodian of records, responded with a denial of all items other than the white collar collective bargaining agreement. Mr. Burke followed up by way of letter, in an effort to avoid litigation, requesting that the documents be provided. Joseph Zisa, city attorney, had subsequent conversation with Mr. Burke and advised that a search for the documents would be conducted and said documents would be produced. When the blue collar and sanitation worker's collective bargaining agreements were not provided there was no alternative but to file suit. 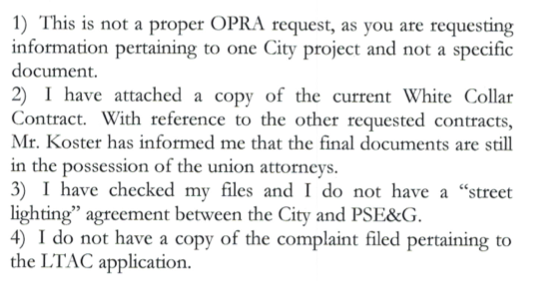 As hard as it may be to believe, the two documents in question are readily accessible and in the position of all city DPW and sanitation workers. Through the course of litigation Judge Doyne advised the city to provide the documents and the city complied thereby making Gelber a prevailing party entitled to legal fees. Mr. Burke asserted that despite attempts to negotiate the payment of fees, and avoid further costly litigation, Mr. Zisa was uncooperative and failed to partake in a good faith negotiation. Judge Doyne identified Burke as an expert in matters of OPRA and noted that though some would consider Gelber a "gadfly" he would identify Gelber as a concerned citizen with good intentions. Doyne awarded $12,000 in legal fees to Mr. Burke. It is a shame that the taxpayer must take the brunt of this matter having absorbed $12,000 of fees for Gelber's attorney and also having to pay Zisa's firm for their handling of this matter. 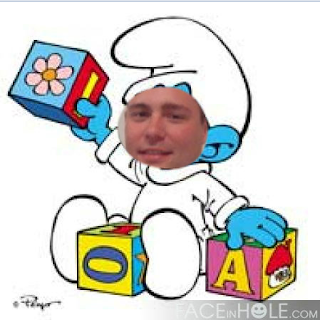 Though today is a "victory for the little guy" there is only one winner here, the firm of Zisa and Hitscherich. Zisa and Hitscherich protracted this matter and carried on an unnecessary litigation racking up the hourly meter at the cost of the taxpayer. 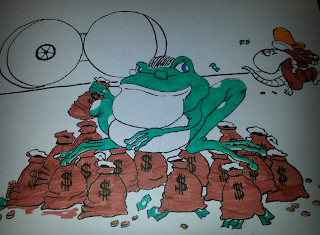 The city legal meter just keeps ticking, and Joe Zisa keeps collecting! 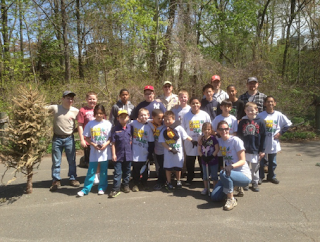 Hackensack's Opening Day was slated for Saturday, April 13. The weather could not have been more cooperative, the sun peaked in and out all day with temperatures near 60 degrees. But where was the baseball? In an email, the Hackensack Scoop was advised that the Opening Day festivities were postponed until Saturday, April 20, due to flooding on the fields at Foschini Park. In the last three years the City Council has appropriated at least $1,850,000 for upgrades, regrading, drainage, and other improvements to Foschini Park. In September 2010 the council authorized the appropriation of $1,000,000 for various improvements to Foschini Park. $950,000 of this appropriation was raised through bonding. Mr. LoIacono stated that with these funds two fields would be realigned and drainage issues would be addressed. As per a change order authorized by the council in January 2011 there was at least $266,000 spent on drainage improvements. In November 2011 the council authorized the allocation of $200,000 from a county grant to be spent on improvements in Foschini Park. It would appear that the City Council had made valiant attempts, at the taxpayers expense, to correct flooding issues at Foschini Park--Howard Hughes also made valiant attempts (near $25,000,000 in 1940's dollars) to make the "Spruce Goose"fly. [A note--I do note take issue with spending money to improve our parks for our recreation department or residents. What I do however take issue with is wasteful spending, or spending that I do not believe is well planned or meaningfully done.] Let me ask you, the taxpayer, with all the Army Corps of Engineers do you think that you can correct the flooding issues at a park that is at sea level and abuts a tidal river? It would appear that Steve LoIacono and the council just continues to chase their tails, here we are nearly $2,000,000 in improvements later with "Opening Day" being cancelled on account of 0.49 inches in rainfall! YOU READ IT HERE FIRST: As previously reported this afternoon, the Hackensack Police were on scene investigating the removal of a campaign sign for the "Citizens for Change" ticket at the Hackensack Market. Such would seem to be a relatively benign disorderly persons occurrence, not worthy of breaking news, however the suspect is identified as retired detective and candidate Kenneth Martin. The complainant Leonardo Battaglia, candidate of the "Citizens for Change" ticket, shares with the Hackensack Scoop that he called the Hackensack Police to report candidate Kenneth Martin removed the signs. He was on scene as the investigation was being conducted and he reports that the police confirmed, to him, that the suspect was seen on a recording removing the sign. I subsequently spoke with Emil Canestrino, of the campaign management team for the "Citizens for Change," who advised that he and Leonardo Battaglia have been in contact with the detectives working the case and they will be signing a complaint first thing in the morning. 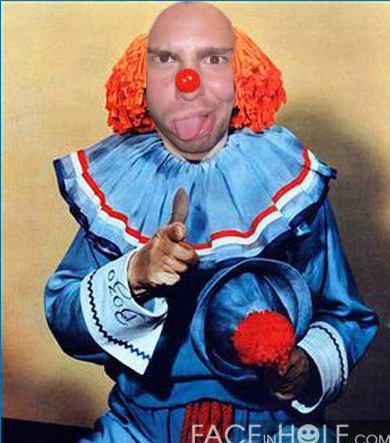 Canestrino notes that this matter is "outrageous as a retired officer and candidate for council should know better than to partake in these childish antics." Canestrino also noted that he will be reporting the matter to the State Election Board. Battaglia went on that "a candidate running under the principles of 'honesty, integrity, and leadership,' (as seen on their website and campaign literature) should be campaigning with a higher level integrity." Hackensack Scoop spoke with the HPD tour commander Lt. Timothy Lloyd who did not provide any further information. He advised that he would not disclose the suspect's name and referred the police director or public information officer for further comment. He also advised that the blotter could not be reviewed outside of "Monday to Friday, 9 to 5." A call for comment to Director Mordaga has not been returned as of the time of publishing this story. Is school board ticket backed by political machine?! 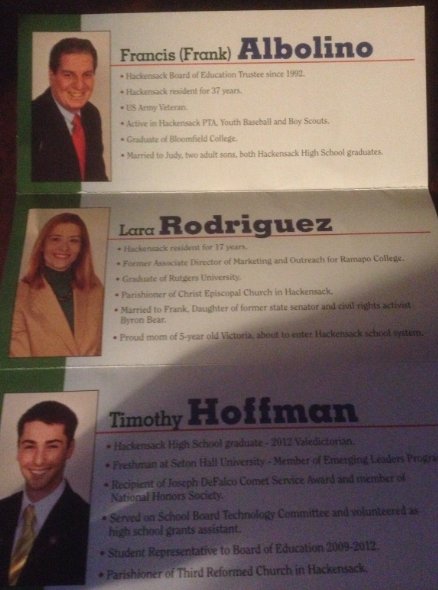 I previously wrote in my meet the candidates article about the alleged ties of the Albolino, Rodriguez, and Hoffman ticket to the Lynne Hurwitz democratic "political machine." If there was any question in your minds before, they can be expelled by the latest mailer from this ticket. On the mailer you will find a number of endorsements including SPEAK OF THE DEVIL that of Lynne Hurwitz (see picture below). Endorsements including Lynne Hurwitz and members of the board affiliated with her "political machine"
Remember the Board of Education is by definition apolitical. The interests of our students should be paramount and outweigh any political interests. Make no mistakes that Lynne Hurwitz (backer of Albolino, Rodriguez, and Hoffman) is an absolute "hardball politician." See this article referencing same. 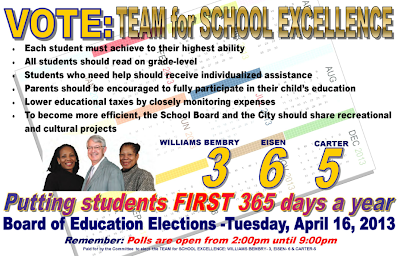 VOTING FOR EISEN, WILLIAMS BEMBRY, AND CARTER IS THE ONLY WAY TO ENSURE THAT POLITICS STAYS OUT OF OUR SCHOOLS AND OFF OF OUR SCHOOL BOARD. 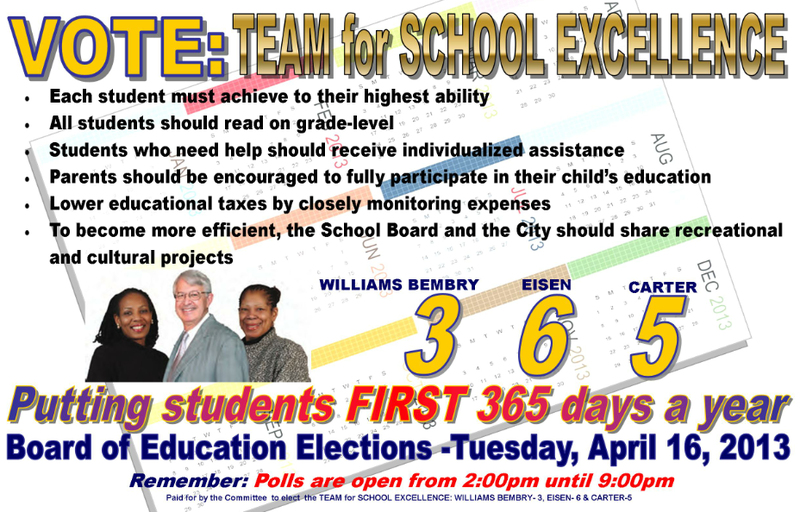 REMEMBER THAT A VOTE FOR 3-6-5 IS A VOTE TO KEEP THE STUDENTS INTERESTS FIRST 365 DAYS A YEAR! 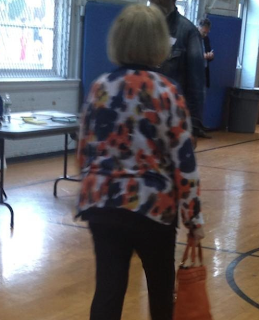 Remember to do your civic duty, like this typical voter! An investigation is currently underway at the Hackensack Market on Passaic Street. Police are investigating the alleged removal, by a candidate for City Council, of the opposing slate of candidate's campaign lawn signs. The complainant who was on scene, has informed that the suspect was caught on digital recording removing, destroying, securing the signs in the trunk of his vehicle. Complaints are to be signed, and the investigation continues. This story is currently developing, more to come. I have a secret admirer! Maybe even more than one! I say secret because they are too much of a wimp to come out from behind their anonymous screen name(s) to sign their name to their opinions. Here are some of my favorites. In any event... this is for you!